Within hours of the restoration of power and communications across the area Facebook and other social media were abuzz with reports about what the churches of the Presbytery of Coastal Carolina were doing in response to Hurricane Florence. Examples of neighbors helping neighbors…. In the immediate aftermath of Hurricane Florence Presbyterian Disasters Assistance (PDA) sent a team of six people to stand with the Presbytery of Coastal Carolina and to assess the magnitude of the disaster caused by the hurricane. Now only a few weeks later, PDA has deployed David Tahlman, a specialist in Long Term Recovery (LTR), to work with the three presbyteries most affected by Hurricane Florence – Coastal Carolina, New Harmony, and New Hope. David is based in Raleigh where he can easily coordinate with FEMA and State of NC authorities but has begun a tour of our presbytery along with PDA National Response Team member Dave Tahlman. After meeting with presbytery staff in Elizabethtown, the team is moving east to visit Duplin, Pender, Onslow, and Carteret Counties over the next few days. The purpose of this visit is to get a sense of the needs related to our congregations, to help churches consider becoming host sites for volunteers, and to encourage the development or redevelopment of Long Term Recovery (LTRG) organizations. PDA specializes in three areas of disaster response within the United States – long term recovery efforts, hosting of volunteers, and emotional/spiritual resilience. David and his colleagues from PDA are available to work with churches and groups in any of these areas. They can be contacted through the Presbytery office or through your Community’s Mission Coordinator. Within hours of the restoration of power and communications across the area Facebook and other social media were abuzz with reports about what the churches of the Presbytery of Coastal Carolina were doing in response to Hurricane Florence. Examples of neighbors helping neighbors lifted the spirits of all who saw the Body of Christ at work. While the initial burst of activity has slowed down, the churches of the Presbytery of Coastal Carolina continue to be engaged not only with continuing needs for food, shelter, and cleaning supplies, but also in building up the infrastructure that our communities will need to connect the volunteers eager to help with those who need assistance. Led by decades of experience by PDA, Presbyterians excel in the creation of committees and work teams who are there for the long haul. The lessons we learned in parts of our Presbytery following Hurricane Matthew are now available to the eastern portion of our Presbytery which escaped much of the damage caused by Matthew two years ago. In the days and weeks to follow we will use this page to inform you of where Long Term Recovery (LTR) groups are being established and where volunteers can be hosted. If you or your church has something to offer to the effort, please contact the Presbytery office or your Community’s Mission Coordinator. Very limited financial resources are available to assist congregations in recovery of their ministry. These funds are designed to come in after insurance and other resources have been tapped. Contact the Presbytery office for details and application forms. Disasters, like any other sort of trauma, leave us exhausted and spiritually drained. Anxiety within congregations, like in any human system, tend to flow to the top. Pastors often carry the heaviest burden of this additional load of anxiety. PDA makes available retreats and other opportunities for emotional and spiritual respite and recovery of balance. Contact the Presbytery office or your Mission Coordinator for details. Hear the report of the GP/SC Search Committee … and Vote on calling Rev. Jerrod Lowry as our next General Presbyter/Stated Clerk. The meeting will begin at 2:00 pm. Registration will begin at 1:30 pm. A brief reception for the new General General Presbyter/Stated Clerk nominee and his family will follow the meeting. NOTE: The commissioner elected to go to the June Community Gathering my serve as your commissioner to this meeting without having to have a session meeting. A new commissioner may also be elected by the session. Please simply come and register on site. Members of the Presbytery of Gid­dings-Lovejoy’s Committee on Local Arrangements (COLA) did an outstanding job planning the 223rd General Assembly in St. Louis that was held at the America’s Center Downtown, June 15-23, 2018. Theme chosen for the Gathering was, “Kin-dom Building of the 21st Century” (Matt. 6:33). At the Pre-Assembly Gathering, Dr. Liz Theoharris, co-founder of the New Poor People Campaign, captivated the audience when she spoke about her experience from campaigning for the poor. She and some others were put in jail for praying on the steps of the state house. She encouraged the audience to keep standing up for the poor and not be silent. Opening Worship began with participants reflecting on the two Missouri and Mississippi Rivers merging together. The 222nd General Assembly’s co-moderators, the Revs. Jan Edmis­ton and Denise T. Anderson encouraged PC(USA) support for oppressed peoples in today’s Mid­dle East, the United States and other parts of the world. The co-moderators delivered a co-sermon, their last message together after two years in that role. It took commission­ers four ballots Saturday evening to elect Co-Moderators Who are: an English as a Second Language (ESL) teacher and a mid-council exec­utive as the Presbyterian Church (US­A)’s. These are the PCUSA’s second-ever co-moderators. Vilmarie Cintrón-Olivieri of the Presbytery of Tropical Florida and the Rev. Cindy Kohlmann of the presby­teries of Boston and Northern New England gained their victory over two pairs of challengers. Cintrón-Olivieri, who grew up in Puerto Rico, is an ESL teacher and rul­ing elder at First Spanish Presbyterian Church in Miami. Kohlmann currently serves as Resource Presbyter for the presbyteries of Boston and Northern New England. The vote was 266 to 253. The 223rd General Assembly confirmed the Rev. Diane Moffett as president and executive director of the Presbyterian Mission Agency by voice vote on Wednesday evening. Moffett will lead the Presbyterian Church (U.S.A) agency charged with conducting the church’s national and international mission endeavors. A vet­eran Presbyterian pastor, Moffett comes to the role from Saint James Presbyteri­an Church in Greensboro, N.C., where she served for 13 year. Commissioners approved Way Forward plan in strengthening the role of the stated clerk and for the church in matters of faith and practice. They rejected the amendments that would have eliminated his ability to exercise pastoral authority during times of crisis and would have required that stated clerk to consult with agency leaders before making a decision to take action. in an unusual move, commissioners waited until the Saturday morning plenary to approve an increase in the per capita rate to $8.95 for the next two years after postponing the vote on Friday night in an attempt to assure the increase covers the financial implications of all actions taken by this assembly. The General Assembly on Saturday approved mission budgets of $71,589,237 for 2019 and $70,531,957 for 2020. The budgets were passed as submitted by the Presbyterian Mission Agency (PMA), but the PMA will be required to deal with financial implications of items approved during the Assembly. The financial implications total $1,030,978 for 2019 and $857,305 for 2020. The General Assembly approved to adjust ministers’ compensation to include gender disparity by giving equal benefits to all. On Tuesday, June 19, hundreds of Presbyterians joined in a march to St. Louis Justice Center to protest the citizens who are unable to post bail from imprisonment and as result have lost their jobs, child custody and other increasing fines. The Bail Project is to help pay those fees that are less than $5,000. The Stated Clerk, J. Herbert Nelson presented a check from the Presbyterian Church. Over $54,000 was raised to assist those citizens which is a part of Rev. Nelson’s Hands and Feet Campaign. ad, the General Assembly sent action to Mission Responsibility Through Investment to do further evaluation and report back to 224th General Assembly. put their money where their hearts were during Saturday’s closing plenary, directing a $1,605 special offering they collected toward causes important to the General Assembly’s co-moderators and stated clerk. ….received $535 for Puerto Rico hurricane relief to honor Co-Moderator Vilmarie Cintrón-Olivieri. PDA’s refugee support efforts received the same amount in the name of the other co-moderator, the Rev. Cindy Kohlmann. The remainder honored Stated Clerk the Rev. J. Herbert Nelson and one of his favorite movements, the Poor People’s Campaign. When a former minister of Word and Sacrament who renounced jurisdiction while being accused in a disciplinary case wishes to work for the denomination again must receive concurrence from the next higher council – recommendation approved. Composition for congregational Nominating Committee to have a minimum size of at least three persons of whom one must be an elder active on the session and there must be a majority vote – recommendation approved. Amendment to instruct Board of Pensions to include 12 weeks of paid parental leave as part of the benefits package was referred. Composition and responsibilities of the Session – when the pastor or designated moderator is unable to be presence or is sick, a member the session may be appointed to preside at a single meeting – recommendation approved. Amendment to allow congregations to elect individuals to be ruling elders without serving on the session – recommendation disapproved. Amendment to prohibit public endorsement of individuals running for public office – recommendation approved. Authoritative Interpretation Request from Presbytery of Coastal Carolina about whether a non-PC(USA) minister can moderate a session in those cases where the presbytery has accepted these pastors who have “satisfied the requirements of preparation” … recommendation approved. You are fee to contact these persons to see if they are available to come share with you about their experience at the General Assembly. A group of 13 adults and young people will be going to Tabasco, Mexico as part of the Presbytery’s ongoing partnership with the Gulf of Mexico Presbytery. This year’s trip is being led by Dr. José Rivera and Dr. Jaime Martinez both of Laurinburg Presbyterian Church. Most of those who will be going to assist with the building of the José Coffin Sanchez Health Clinic and Vacation Bible Schools in three different churches come from the Laurinburg Church but members of the Bethesda Church and Presbytery ledership will also take part including Rev. Sue Hudson and Rev. Bill Reinhold, our Genreral Presbyter. The Mexico partnership is part of our our Shared Mission in the Presbytery. Becky Durham was approved as pastor of the Peace Presbyterian Church in Fayetteville by the Central Commission after an examination of her on May 9, 2018. She was recommended for examination by the Central Missional Community for ordination as a minister of the Word and Sacraments on June 2, 2018 pending her election as pastor by the Peace Church congregation. Peace Church’s congregation accepted the recommendation of their Pastor Nominating Committee (PNC) on May 27, 2018 and is pleased to bring Becky to the Central Community for examination for ordination and, if approved, for confirmation as pastor of their church. Pending the approval of the Central Community, Becky’s home presbytery (Western Kentucky) will be asked to ordain her on behalf of Coastal Carolina in her home church. She will be installed as pastor of Peace Church at a later date. Are only high budgets sacred? Are only high attendance congregations holy? What are sacred stories in our Presbytery? Sacred Stories is an endeavor to share with each other what is sacred: the surprising moments and delightful outcomes where God is active in our congregations—regardless of their size! There are simply too many stories of exciting things congregations have been inspired by God to do that can be shared during presbytery meetings or even pastor luncheons. That’s why this Presbytery has taken time to put together videos and audio recordings of stories from over 18 congregations throughout our presbytery so you can rejoice at what God is doing in our midst! With your help we can add stories from your congregation in the future. Audio/podcasts are perfect for drives or while doing chores at home. Videos are great if you’re near a computer device at home or work. You can help share the good news by watching them and sharing them throughout your congregation at fellowship meals, worship, bible studies, small groups or through email and facebook. Simply CLICK HERE to reach the current collection of sacred stories that bear witness to the movement of the Spirit in congregations throughout Coastal Carolina Presbytery. Questions or comments about this endeavor, please contact Rev. Evan Harrison at pastor@sspchurch.org . The Presbytery of Coastal Carolina is seeking candidates to serve as General Presbyter and Stated Clerk of the Presbytery. The joint position (GP and SC) is for a three year term which is scheduled to begin in November of 2018 when the incumbent retires. 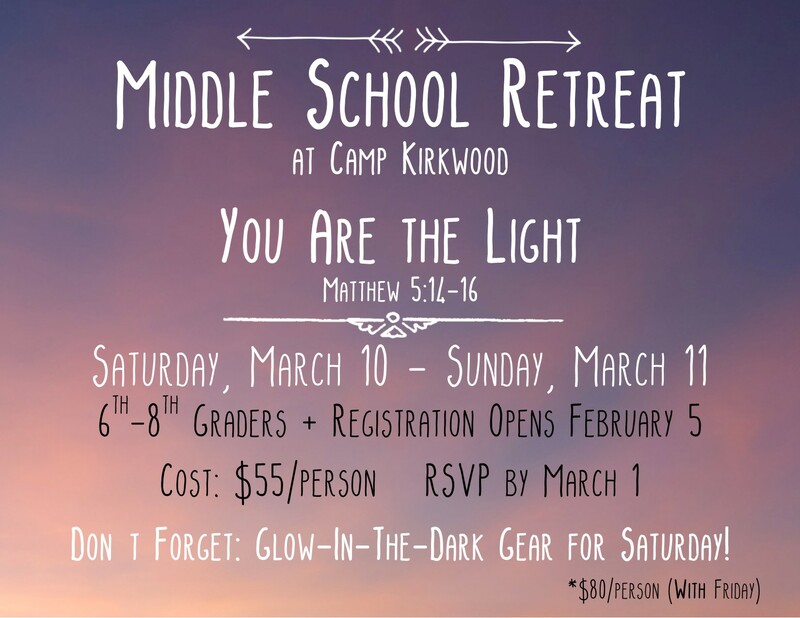 Please join us for this year’s Middle School Retreat, March 10-11, 2018 at Camp Kirkwood. The retreat will be led by youth and adults of our Presbytery and our Presbytery Youth Council. We will have keynotes, worship, music, and fun recreation options around the camp. The retreat begins with registration Saturday morning between 9:00-10:00am followed by a Welcome and Keynote. We will conclude after worship Sunday morning no later than 11:30 AM. This year we are offering the option of arriving on Friday evening. The program will not officially begin until Saturday morning, but realizing some of our groups have far to travel, we offer this opportunity. The cost is $25 extra per person (for breakfast and housing) and we ask that you not arrive before 8 PM Friday night. We will have snacks available Friday night and a gathering space available. If you want to take advantage of the Friday evening option, you must register BEFORE March 1. Camp Kirkwood consists of 195 acres of pristine nature and is just outside of Watha, North Carolina. The camp has eight cabins (with heating/ac and indoor bath facilities) which are scattered though the camp and each is capable of sleeping 8-10 persons bunk style. Near the main lodge, where we will have keynote and meals, there is an eight-acre lake which is canoe and kayak accessible. One highlight of the lake is its breathtaking Vesper Dell which seats approximately 150 people. With Presbytery approval, the day of fruition finally came! Started as a small Hispanic mission ministry in 1999, our newest church in the Central Community of the Presbytery was joyfully chartered on November 12, 2017, at Galatia Presbyterian Church. We celebrate with thanksgiving and praise to our Lord, Jesus Christ for the pastor, CRE Trinidad Martinez Solis, the elders, deacons and members of the new First Hispanic Presbyterian Church of Fayetteville and the full support of the Galatia Presbyterian Church which has hosted the community from the very beginning. From 1999 to present several persons served on a steering team to work with members and evangelists to help this new church grow. The other congregations in Fayetteville showed support in many ways over the years to help this congregation thrive. The Presbytery staff, especially Eduardo Moreno, nurtured this congregation diligently over these years. Rev. Moreno continues to teach a CRE/QRE course on Saturdays to raise up more Spanish speaking leaders and evangelists. It was through one of Rev. Moreno’s 2 year programs that Trinidad Martinez became eligible to serve as pastor of this congregation. As this new church moves forward to be the church God is calling them to be, let us keep them lifted up in our prayers. Anytime when you are available, you are cordially welcome to worship with them. Worship service happen each Sunday at 1:00 P.M. in the sanctuary of Galatia Presbyterian Church, 8800 Galatia Church Road, Fayetteville. All are welcome. Rev. Eduardo Moreno, Hispanic Mission Coordinator. Our Presbytery continues to nurture Spanish language out reach in St Pauls, Fuquay-Varina, Sanford, Seven Springs, and Faison. Your continuing prayers and support make these ministries possible. Shared Mission Support of Presbytery makes this evangelism and new church development possible. Together we are in Mission. On November 4th, a perfect fall day, the East Community of our presbytery came together at beautiful Camp Kirkwood for a time of workshops and worship. The theme “Refresh, Renew, Redeem – The Next 500 Years” was an opportunity to acknowledge the 500th anniversary of the Reformation, but most of all, to equip participants to be effective missional leaders for the church today and tomorrow. “About Music and Art: Using our Senses to Know and Love God” led by Ginger Hedblom and Laurie Russ, Southport Presbyterian Church. The event concluded with worship which included a piper, art and music created and led by workshop participants, and a meaningful message of God’s grace and power preached by Rev. Ann Jahnes. Worship also included an offering for hurricane relief to assist folks in Pender County who continue to recover in the wake of Hurricane Matthew. It was another inspiring, fun time for the East Community to be together! Senior High Retreat at Camp Kirkwood! Since a lot of us are delayed with Fall Fest/Halloween, I’m extending the RSVP deadline to Sunday, No v. 5. The event is filling FAST. Please make sure you are getting the correct paperwork for all of your participants, and that you have sent payment into our Presbytery office. Each youth needs an Emergency Form, Covenant/Likeness Waiver, and the Kirkwood Waiver (for zipline, canoes, etc). Each Adult needs an Emergency Form, Covenant/Likeness Waiver, Background Cert. Form, and Receipt of Child Protection Policy Form. **Kirkwood Waiver Optional. College Students, please send deposits and registration forms by November 13. I can mail hard copies, if needed. Because of your generosity to PDA and the One Great Hour of Sharing, both the Long Term Recovery Committee of Fayetteville and of Lumberton have each been able to employ Executive Directors to manage and guide this unprecedented long term recovery process in these communities. $120,000 in the form of two grants has funded these positions. Now under the leadership of these new directors, these communities can move more smoothly to welcome volunteers, raise needed funding, properly report on the use of funds, coordinate the communication of the many agencies and churches aiding in disaster recovery. In addition to funding these two positions, PDA has worked with Highland Presbyterian Church to enable them to host work groups. Arriving groups will be able to serve in both Fayetteville and Lumberton as needed. When people call the PDA National Call Center, PDA ensures that the group’s skills and dates are in alignment with local rebuilding projects and opportunities. Highland Church will welcome partner churches to assist in welcoming hospitality for these arriving groups. Contact Rev. Bobby Newman to learn more about assisting with hospitality for incoming groups. Groups are being scheduled now. River to overflow and many homes, churches, and businesses, including two schools and the district office flooded. The electrical power went out for several days, and the city water had to be turned off as it too was contaminated. Many people left their homes feeling shocked, afraid, and very discouraged, and were placed in temporary shelters. From that unexpected natural disaster, Robeson County Disaster Recovery Committee was organized. Keep the families and volunteers in prayer. Adopt a family by assisting with unmet needs. Adopt a house by supplying building materials. To learn more please come to any of the weekly meetings, held each Tuesday. Six families remain in hotels now, 9 months after the hurricane. Can you imagine living in a hotel for 9 months? Likely having no real kitchen to speak of, no refrigerator, no stove, no individual bedrooms, one bathroom for everyone, no room for books or toys, no privacy…. further away from your place of employment or your school… This kind of living is stressful, expensive, challenging, disruptive. In Lumberton the number of families still in hotels is much higher. This is why the rebuilding-recovery work remains urgent. In addition to people in hotels many people are in temporary housing – rentals, trailers, living with extended family, etc. while homes and businesses are rebuilt. Paying both rent in temporary shelter while also paying a mortgage on a home you cannot use is a financial nightmare for so many survivors. The Long Term Recovery work provides not only mental health support for these stressful realities, it also provides case management to assist people in navigating the various sources of help needed to live in these challenging times. Our Long Term Recovery Groups speak with and on behalf of survivors to raise money and volunteers to get our neighbors back on their feet. we offer light in darkness. This rebuilding can only be truly done with your help. The Fayetteville CDRC needs an accountant to review the books and bring the accounting policies up to date. The CDRC meets every other Tuesday at 5:30PM. Visitors are welcome. The Fayetteville UMCOR (United Methodist Group) is seeking funding ($40,000) to employ a construction manager or a volunteer construction manager. Job sites are waiting now. Also needed is a heavy duty construction level pick-up truck or $20,000 to secure one. To volunteer but not stay overnight, just contact CDRC or RCDRC as listed below. Thank you for Caring, Praying and Helping! Tested, effective resources for any pastor and any congregation. Offering one day seminars, ongoing training for pastors, guidance to sessions and support for leaders. Beverly and George bring a unique set of experiences and skills to their ministry as coaches. Beverly is a third-career pastor, a native of Atlanta, who served congregations in Atlanta and northeast Georgia and taught leadership and ministry practice in Atlanta. She holds a D.Min. degree in spirituality from Columbia Theological Seminary. George has served several congregations across the country and for 14 years was Professor of Leadership and Ministry Practice at the Interdenominational Theological Center in Atlanta. He holds doctorates in spirituality, biblical interpretation, and theology and the human sciences. Beverly and George Thompson share ways for congregations to connect with their work on vibrant congregations. The Thompsons were field consultants with the Alban Institute and have published several books, the most recent being Grace for the Journey: Practices and Possibilities for In-Between Times (2011) and Ready to Lead: Harnessing the Energy in You and Around You (2015). They now are engaged in this ministry as the full time coaches for Coastal Carolina Presbytery. For more information, call 404/731-3281 or email drbeverlythompson@gmail.com. On offering will be taken during plenary for a ministry which will be announced in a following email. Even if you are not an active member of a PW Circle, come anyway! You are a woman in the Presbyterian Church (USA), it will be a great day to mingle, meet, and greet your sisters in the faith and to hear what Presbyterian Women, Inc. is all about! No pressure. We are just the continuation of women in ministry that began over 100 years ago! There may even be some attendees who are 100 years old! Women will be traveling hours, some staying overnight, to be together for this brief but important even. and a time to plan for the future. Come be part of the renewing of our friendships and meet women you might never otherwise have an opportunity to meet because we live so far from one another. Let this be an intentional time of travel for the express purpose of reaffirming our unity in Christ Jesus and our commitment to spreading the gospel of Love in Christ! Find out more about LaVera, her ministry, and her mission at the following websites. On her church website is a link to hear audio recordings of her sermons and to read her blogs. Enjoy! The Antioch Presbyterian Church Facebook page. You can catch a glimpse of LaVera in a photograph. Our Pastor, LaVera Parato, was officially installed today!!! So glad to have her as our Preacher. Invite a friend and mention to the moderator at your church that you will be planning to attend. Display your visual arts creation at the PW Spring Gathering. We are pleased to have the opportunity to display paintings, fiber arts and photography for the Annual Spring Gathering of Presbyterian Women in Coastal Carolina Presbytery. The Gathering will include all the Presbyterian churches in the Coastal Carolina Presbytery and will be held on Saturday, April 22, 2017 from 10 AM – 1:30 PM at St. Andrews Covenant Church, 1416 Market Street, Wilmington, NC 28401. It will be a wonderful day celebrating and worshiping with women and we hope all of the artists will not only bring their art work but enjoy this special time together on Saturday. If you would like to share your original artwork or artwork you have perhaps inherited or acquired, then read the guidelines below. Once the church offices close on Friday afternoon, the building will be secured for the night. The doors will open at 8:15 AM on Saturday morning as attendees begin to arrive. Have work framed and ready to hang with a longer than usual wire on the back. If you desire to have your piece displayed on an easel, please provide the easel as well. Have a card with your name and phone number taped to the back of your work. Thinking about how these visuals are a reflection of the love God has for us, for others we meet, and in our creativity, provide a Bible verse on a small card that reflects your artwork. We are planning to put the verse on display beside your piece. Contact kathyrbenson@juno.com if you have questions. We look forward to this day of fellowship, worship and celebration! Presbytery Youth Council Needs You! If you are a young person in grades 9-12 (or if you know one) and you have an interest in youth and church leadership, we need you! It’s that time of year again when we are taking applications for the Presbytery Youth Council. The Presbytery of Coastal Carolina Youth Council is a unique opportunity for 9th – 12th graders to gain (and share) valuable leadership skills, learn more about the Presbyterian Church (USA), get to know other youth from the Presbytery, and serve the church in an important and challenging way. Our Youth Council currently plans several events and there will be youth activities happening in each community. Each member is asked to serve a two year term. You may “renew” when your two year term is up, or you may rotate off after one year if necessary. All members must be present at the October Presbytery meeting where we as a council are installed. Members are asked to be present for at least two youth council events. This includes planning meetings before events. We will schedule those closer to our events. If you or someone you know would be a good fit for our Youth Council, please download the application below and return it by August 1, 2017. If you have any questions, or if you are an adult wishing to serve on the Youth Council, please contact Erin Wehrmeister, presbyccyouth@gmail.com or (910) 578-7724 .